There’s something sort of funny about listening to someone try to describe the structure of Cloud Atlas. Walking out of Symphony Space one evening last week — David Mitchell was the shy and extraordinarily charming guest of honor at the opening night of PRI’s “Selected Shorts” — I heard lots of people try to explain the book to their companions. “With the ship, and the Pacific, it feels like the last one,” a woman said as we shuffled towards the exits, referencing the first (and final) section of Cloud Atlas and Mitchell’s most recent novel, A Thousand Autumns of Jacob de Zoet. “Ah, well.” Her friend leaned in and said in a knowing tone, “I can see that, but once you get to Sonmi…” The same phrases spilled out onto 72nd Street: “story-within-a-story;” “Russian dolls;” “a bunch of cliffhangers!” One man shouted at his date, “And that leads to the next section!” People were waving their hands in the air, evangelizing a book and its concepts that, at first glance, could strike the uninitiated as inventive or contrived. I’d gone to “Selected Shorts” alone that evening, but had I brought along someone to whom I could evangelize, I’d have described Cloud Atlas as a pyramid — six different novellas set across six different points in time, building up chronologically. Each story is cut in half, and we must climb to the peak, to a dystopian far future (which is presented without pause) and climb back down to reach the conclusion of the other five stories. We begin and end in the mid-19th century. Narrative threads, from big themes to small gestures — the act of drawing a map, for example, or certain words that crop up again and again — extend and echo up and down the pyramid. But by and large, Mitchell’s gamble paid off: Cloud Atlas has been widely acclaimed in the near-decade since its publication, not least of all here at The Millions, where it was retired from the Top Ten a few years back and voted #3 in a survey of the best books of the millennium so far. You’ve probably been seeing a whole lot of the book around recently, or of Mitchell himself, who’s been shuttling back and forth between New York and Los Angeles talking to the press. It’s all, of course, because of the film, the publicity for which has been hard to ignore, from the five-and-a-half-minute behemoth of a trailer released this past summer to the completely unhelpful teaser trailer that’s been running in heavy rotation on television (it’s 10 percent crazy sci-fi special effects and 90 percent Tom Hanks saying something folksy). The project is a collaboration between the Wachowski Siblings, Lana and Andy, of Matrix trilogy fame, and Tom Twyker, the German director of films like Run Lola Run. Much has been written about the filmmakers’ struggle to find financial backing for the project: six storylines set in wildly different time periods and genres — it’s a hard sell however you spin it. And much, in turn, has been written about how they spun it: the process by which such a structurally unique book could be transferred to the screen, and if it could survive such a translation. Mitchell himself told Aleksandar Hemon, for a profile of the Wachowskis in The New Yorker last month, that, “As I was writing ‘Cloud Atlas,’ I thought, It’s a shame this is unfilmmable.” Some portions of the book — most notably, “Half-Lives: The First Luisa Rey Mystery,” a thriller set in the 1970s that’s the pulpiest of the bunch, complete with a ton of internal monologues — are fairly cinematic to start with. But it’s one thing to ask a reader to stop and start six times, and then repeat it all over again on the way back. In a movie, everyone agreed, this structure would never work. But all three directors were so enamored of Cloud Atlas that they decided to give adaptation a go. They broke the book into plot points — “hundreds of scenes,” Hemon writes. “[They] copied them onto colored index cards, and spread the cards on the floor, with each color representing a different character or time period.” They pulled out arcs, drew connections, and read the reconstructed stories aloud. Then the cards went back on the floor, and were reshuffled and rearranged. They found an initial way into the eventual restructure with Dr. Henry Goose, a major character from the first novella, which is set aboard a ship in the South Pacific in 1849, and Zachry, the protagonist of the far-future dystopia, set a good deal after “the Fall,” when modern civilization seems to have totally collapsed. Henry is morally weak, cowed easily by greed and violent urges; Zachry spends most of his story struggling to throw off these same human impulses, cloaked in ignorance and fear. Mitchell’s six main characters are loosely linked by destiny, physically manifested in comet-shaped birthmarks and half-found (well, half-lost) works of art; the directors wanted to draw links between major and minor characters across every era, linked by common ideals and struggles. And thus what Mitchell has characterized as the “‘transmigrating souls’ motif” was born: a single actor for multiple characters, certainly one of the most publicized elements of the film. Tom Hanks plays the two aforementioned characters, as well as a blackmailing manager at Frobisher’s hotel, conflicted nuclear engineer Isaac Sachs in the ’70s, and in the modern era, Dermot “Duster” Hoggins, a thug who throws a book critic off a balcony (at a screening of film critics, this earned some seriously awkward laughs). If you’ve read the book, you’ll be able to line these characters up side by side: it’s easy to see the moral arc here, and as a reader, it’s an interesting exercise to re-cast the book, as it were. Some actors — Hugo Weaving, as unwavering evil, and Hugh Grant, as an eternal sleazebag who always succumbs to it — play stagnant foils. Others — Jim Broadbent and Ben Whishaw — dance around each other in delicate balances of power. But the repetitive casting, the filmmakers’ big tricksy device, is one that, with the movie’s release, has drawn more ire from critics than praise. Many early moviegoers were distracted by the frankly bizarre-looking prosthetics, particularly in 22nd-century Nea So Copros, re-named in the film world a more recognizable “Neo Seoul,” where genetically-engineered clones, or “fabricants,” are bred to do humanity’s dirty jobs without complaint. And some of the accents — Tom Hanks is certainly the biggest culprit here — are distractingly poor as well. 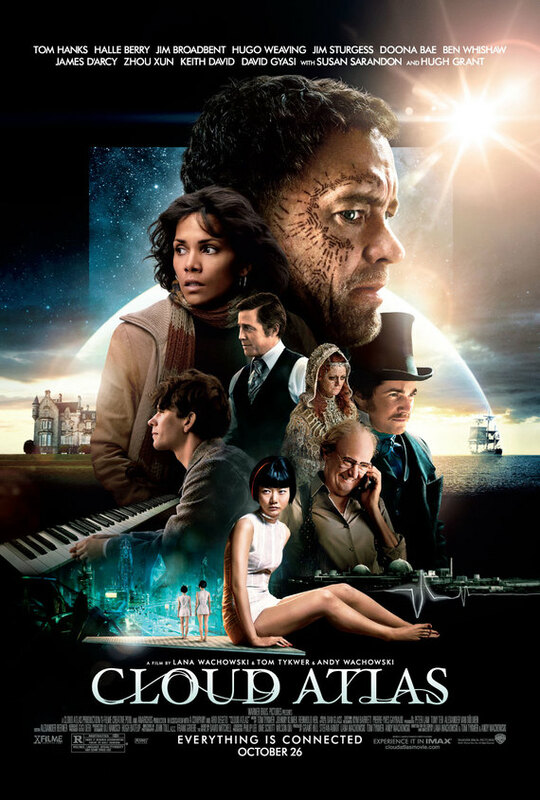 There’s an obvious futility in comparing a book to the subsequent movie, but Cloud Atlas is no mere adaptation: it’s a big, ambitious structural overhaul, one that has been likened by Mitchell, amongst others, to a mosaic, all of his Russian dolls smashed to pieces and carefully reassembled. The plotlines are interspersed, with tight transitions between moments that often mirror each other in action or in theme. Sometimes that’s rewarding — it’s easy to get mired in a single section of the novel, and the quick steps between eras feel freeing by comparison at times. But we lose a fair amount of breathing room in the process, and fans of the book may mourn that loss. Sonmi~451, the fabricant hero of the Nea So section, still gives her orison to the archivist, but many of the meditative qualities of the year-long storyline are gone, replaced by fast and loud action sequences that boil down the sharp edges of what is in the book a deeply complicated narrative. In fact, grey areas turn black and white all across the six stories, either altered or overshadowed by the movie’s broader themes, or shortened for time’s sake. And then there are the moments when Mitchell calls his own narratives’ truthfulness into question. Sonmi~451’s first words are, “Truth is singular. Its ‘versions’ are mistruths.” But Mitchell enjoys undercutting this idea, like early on, when Frobisher discovers half of “The Pacific Journal of Adam Ewing,” the account of the first novella, and writes, “Something shifty about the journal’s authenticity — seems too structured for a genuine diary, and its language doesn’t quite ring true — but who would bother forging such a journal, and why?” The film is always pressing forward in time, and is largely, unflinchingly earnest — there’s no halting for the novelist’s tricks, and the storylines seem shallower for it. None of the major changes the film made to my novel “threw me off” in the sense of sticking in my craw. I think that the changes are licensed by the spirit of the novel, and avoid traffic congestion in the film’s flow. Any adaptation is a translation, and there is such a thing as an unreadably faithful translation; and I believe a degree of reinterpretation for the new language may be not only inevitable but desirable…[The filmmakers] want to avoid melodrama and pap and cliché as much as I do, but a film’s payoff works differently to a novel’s payoff, and the unwritten contract between author and reader differs somewhat to the unwritten contract between filmmaker and viewer. Adaptations gloss over these differences at their peril. But the language of the adaptation — and yes, it’s a little shameful to turn Mitchell’s well-crafted metaphor into something so literal, and I apologize for that — does leave something to be desired. Mitchell is a brilliant linguistic shape-shifter. In the South Pacific, Ewing’s Victorian diary entries are both lively and endearingly stiff. In the 1930s, Frobisher’s sentences fly past like whip-cracks, and the lyricism is oftentimes so charming that we’re distracted from his prejudices and his flippancies. Some of the lines remain, but the narrative voices are mere echoes of their originals. Nowhere is this more apparent than in Neo Seoul: in the book, in a world where people worship fast-food mascots and project advertisements onto the moon, language has been deviously corporatized — citizens are consumers, fabricants like Sonmi~451 are servers, and they all read sonys and watch disneys and drive fords and remove their nikes at the door. I imagine legal complications kept these terms out of the film. But even the language that carries over loses its impact aloud: Xultation is much more strikingly written. And in the far future, where English has shriveled to a bastardized pidgin strain — “Adam, my bro, an’ Pa’n’me was trekkin’ back from Honokaa Market on miry roads with a busted cart axle in draggly clothesies.” — it’s often much harder to follow the words aurally, rushing so quickly out of the actors’ mouths, than it is to read and translate for yourself on the page. In the end, it’s a question of mosaics and Russian dolls — of a set of stories, a pile of reshuffled index cards, and the new stories that emerge. If the film is the book distilled, its characters and their choices are sometimes easier to follow and appreciate. But the depths and complications of the novel must lie at the heart of why so many readers — including the filmmakers themselves — loved it to begin with. We are told, for the entire duration of the movie, that everything is connected. But Mitchell doesn’t have to tell us outright: the six stories are, at their hearts, the same. It always began as an ordinary dream. But at some point Mary Poppins would fly overhead on her umbrella, look toward the “camera” of the dream to deliver a cackle, then fly off, turning whatever pleasant fantasy I’d been having into terrifying chaos. Everything in the dreamworld became darker; trees died, I got lost and left behind in a grim landscape, and I fell victim to all sorts of other horrible things I’ve managed, thankfully, not to remember so clearly. We are told, for the entire duration of the movie, that everything is connected. Are we? This is true for the trailer, certainly, but the movie doesn’t hammer the viewer over the head with that pap nearly as much as I’d feared. A few bits from the movie bugged me — an elegant home with ladies in posh Victorian dresses and attended by slaves (?!) in San Francisco barely a year into the gold rush; the unfortunate critic landing in the street like a ketchup-filled water balloon; a happy ending on another planet; etc. But other parts worked very well (for me, especially the Cavendish and Frobisher chapters), and on the whole I have to admire the filmmakers’ ambition and sincerity in taking on such a project. Also, as much as I love the book, I suspect it will be much easier for those who haven’t read it to enjoy the movie.